Colin Wells Eglin was born in Sea Point, Cape Town, Western Province (now Western Cape) on 14 April 1925. His parents, Carl August and Elsie May Eglin were religious. He grew up in Pinelands, Cape Town, but moved at the age of nine to live with his aunt, outside Hobhouse, Eastern Free State after his father died. Eglin attended the Hobhouse School where he was the only English–speaking learner. The tension between the supporters of D.F. Malan and those of Barry Hertzog in the mid-1930s was mirrored in his aunt’s home, and deeply affected him. Eglin left Orange Free State (now Free State Province) when he was in standard Six and then attended the De Villiers Graaf High School in Villiersdorp where he matriculated in 1939 at the tender age of 14. In 1940 Eglin registered for a Bachelor of Science degree in quantity surveying at the University of Cape Town. In 1943, at the age of 18 he interrupted his studies to join the army. He became a full-time instructor in the anti-aircraft unit in Cape Town. He was then sent to a similar unit in Egypt and transferred to Italy. He took part in the South African assault on Monte Sole, after which the Allies broke through to the plains of Italy. After the War he remained in Italy for nine months, waiting for demobilisation. During this period he undertook extra-mural courses in Archaeology and Town Planning. In 1946 he returned to South Africa and continued with his studies, graduating the same year with a B.Sc. in Quantity Surveying. He became involved in civic affairs and started the Pinelands Young People’s Club which helped set up a sister organization in the neighbouring Coloured village of Maitland. In 1951 he became chairman of the Pinelands Civic Association and was elected to the Pinelands town council. In 1953 Eglin became a political campaign manager for his friend Zac de Beer, who was the United Party (UP) candidate for the parliamentary seat of Maitland. In 1954 he was elected unopposed as the UP provincial councillor for Pinelands. In addition to that, he became chairman of the UP’s Cape Peninsula Council and then in 1958 Eglin became the Peninsula MP. He was one of the rebels who issued a declaration of dissent in August 1959, following the UP congress in Bloemfontein. In November the same year he was one of the 11 members of parliament who formed the nucleus of the new Progressive Party (PP). In 1966 he became chairman on the National Executive of the PP. In 1971 he became the party leader succeeding Jan Steytler. He stood for parliament in Sea Point in 1966 and 1971, losing on both occasions. In an attempt to attract Afrikaners to the PP, he initiated ‘Deurbraak’, the first journal of verligte (enlightened) opinion in South Africa. Eglin initiated a dialogue between the PP and Black homeland and urban leaders. He was also instrumental in establishing Synthesis, a non-party political study and discussion group, which became an important tool for information and contact across the colour bar. In 1974 the PP won six seats in the general election with the seventh coming from a by-election a few months later. In 1975 Eglin negotiated the merger with members of the Reform Party, which led to the formation of the Progressive Reform Party (PRP). In 1976 he called an Extraordinary Parliamentary session to discuss the Soweto Uprising. In this session Eglin called for the resignation of the Minister of Bantu Affairs, MC Botha, for his poor handling of the event. In 1979 he stepped down as PRP leader in favour of Dr F van Zyl Slabbert and was elected national chairman of the party. He resigned after his leadership qualities were questioned following dissatisfaction within the party. Following the dissolution of the UP, some members were co-opted by his party, and the PRP became the Progressive Federal Party (PFP). 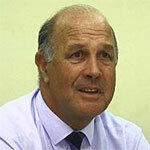 In 1986 he was re-appointed chairman following the resignation of Van Zyl Slabbert. He was the party leader until 1988 when his friend Zac de Beer was elected party leader. Eglin was instrumental in negotiations with the Independent Party and National Democratic Movement to bring together a new opposition to the National Party in parliament. This resulted in the formation of the Democratic Party (DP) in 1989 and the dissolution of PFP, where, he was elected chairperson of the DP’s parliamentary caucus. Eglin travelled extensively in Africa, Europe, America and China. During visits to 15 African countries, he met many heads of state. For many years, while she was the Progressive Party's sole MP, he acted as Helen Suzman's link with extra-parliamentary activities. He also held a symposium of 50 Afrikaner academics in 1971, from which a non-party-political movement, Verligte Aksie, was formed. In 1991 he participated in the Convention for a Democratic South Africa (CODESA) and served in its working group. Eglin was married to Joyce Mabel and they have three daughters. Eglin was made an Officer of the Order of the Disa in 2004, conferred by the Western Cape Provincial Government. In April 2013, the South African Government conferred the Order of the Baobab, Category II (Silver) on Eglin for serving the country with excellence and for his dedication and courage in standing up for the principles of equality for all South Africans against the unjust laws of the past. Colin Wells Eglin passed away on 30 November 2013.